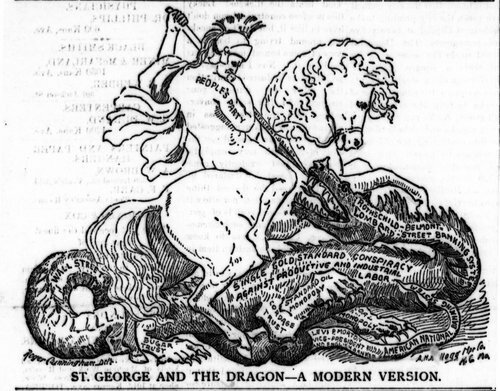 This political cartoon from the Topeka Populist newspaper, depicts the People's (Populist) Party as St. George, the patron saint of England, who is slaying the dragon that represents the corruption of government and big business. The dragon has the names of specific businesses and politicians written on its body. According to legend, St. George was a fierce warrior who saved a village in Libya by slaying the dragon who had demanded that the town sacrifice all its young women. This is one of the few political cartoons selected for this standard that depicts the Populists in a favorable light. Thus, it could be paired with an anti-Populist cartoon (such as one from Judge magazine) to compare the two perspectives.